JEDDAH: Although Saudi Arabia doesn’t have much to show in swimming, Bader Al-Muhana managed to earn some recognition by becoming the only Saudi swimmer to pass the FINA (International Swimming Federation) qualifying standard for the Beijing Olympics. Alex Brodai, Al-Muhana’s Ukrainian coach, said, “The first time doesn’t count because it’s like a chance to learn and become better.” He explained that participating in the Olympics is almost like a life-changing experience. As soon as the athlete participates in the Olympics his behavior, performance and skills improve. “This is what we aim for considering his young age compared with the other world champions,” he said. Ali Oun, former Secretary-General of the Saudi Arabian Swimming Federation, said Saudi Arabia participated twice in the Olympics through Ahmed Al-Kudmani in both the 2000 Olympics in Sydney and 2004 Games in Athens. “The participation was not up to the level,” said Oun. 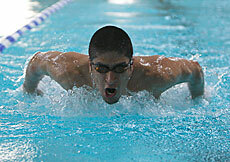 He, however, added that Saudi swimmers have shown great improvement in GCC and Asian levels. He said that the road to achieving good results in international competition is tough. “They still have time but maybe not this Olympics,” he added. He said that nevertheless they would have to focus and work hard to achieve the best result in order to be prepared for the 2012 Olympics in London. The 20-year-old swimmer started his first stage of training camp in Dammam before he left for Hungary a few days back to continue his Olympic preparations. The Saudi Swimming Federation, Al-Muhana said, sent FINA a performance record of the members of the national team and based on that chose the athlete that met the qualifying standard. “Thank God the FINA chose me. I am overwhelmed because I’ll be swimming with the best,” he said. Among Al-Muhana’s international exposure was participation in the FINA World Cup for two straight years in 2006 an 2007 in Canada and Australia respectively. During the 15th Asian Games in Doha in 2006 Al-Muhana clocked 56.93 seconds in the 100 meters butterfly and 25.10 seconds in the 50 meters butterfly. Al-Muhana wishes that his participation in such a huge event would open the door for many Saudis to become interested in swimming. “I know it is not as popular as football. It is about time people get exposed to other sports here in the Kingdom,” he said.